Yesterday went well, got to see my dad and help take care of him a little. My sister and brother are really working hard at helping them as well. We purchased the burial plots. Honestly they are really nice and in the older part of the cemetery near a lot of the large maple trees. I will post photos after I go up next. The plots ran $3,428. It was expected and worked out fine. I had enough on my credit card to pay for it for now. The one thing I was not expecting is you can bury 5 cremations on top of the casket so each grave could hold up to 10 people if 8 of them wanted to be cremated (which funny enough is what my spouse and I would prefer). It means though that I can take care of any family, friends or others that want to be cremated. I am trying to avoid pulling any money from here until he passes. 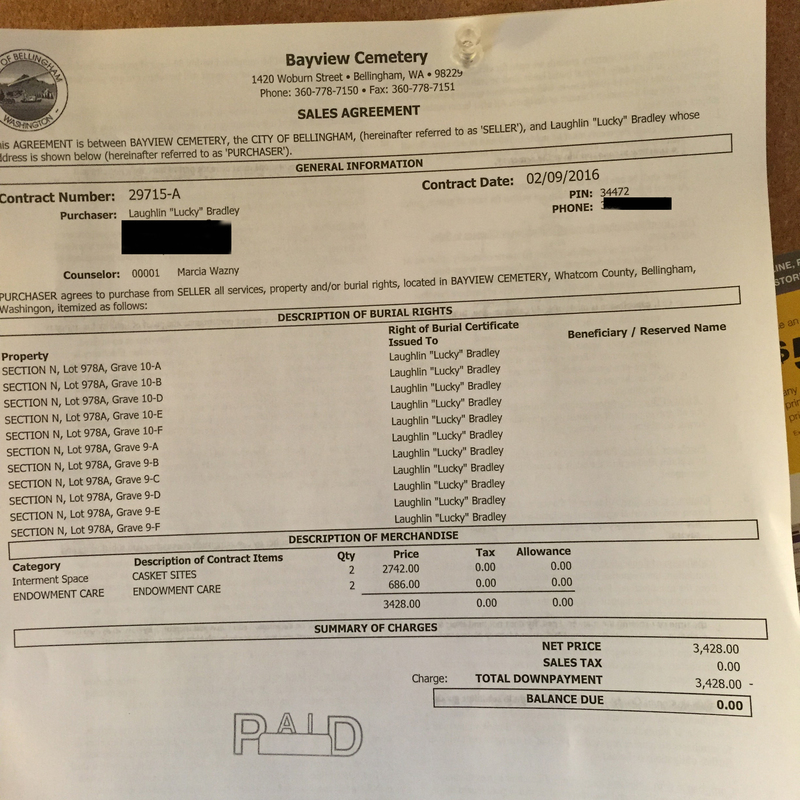 The grave liner and opening/closing the grave fee is about $1,600 in addition to the burial plots (and the funeral services will probably be close to $4k) and I am hoping to not have to withdraw the donations until that point in time. I don’t think I can thank people enough. The outpouring of not only financial but emotional support has been huge. I don’t even know what to say about it except we are touched. Thank you for everything. I have attached the picture of the purchase. I think it is incredibly important that people see exactly where the money went and what it was for. I realize most people do not do this (and it probably isn’t needed) but I always want to make sure people know what is exactly happening when they have been this kind to us.